Pawpaws hang from a branch. The inside of a pawpaw. Thomas Jefferson had these growing at Monticello. The Lewis & Clark expedition relied heavily upon then when their supplies ran low. Native Americans not only ate their fruit, but used the strong fibers for cordage. The Pawpaw tree has been lauded in song and its fruit praised for its taste, described as a combination of mango, banana and pineapple. So with all of this notoriety, how did this large, green fruit – grown in 26 states, spanning across the south and Eastern U.S. – lose favor with Americans? Well, it doesn’t travel well. The ripe fruit’s custard-like consistency mushes easily and has a shelf life of only two or three days, too short for commercial markets. And its appearance – speckled yellow-green skin and beanlike shape – can be off putting to some. And, as humans began scavenging supermarkets instead of forests, we simply forgot about the humble pawpaw. Not any longer. 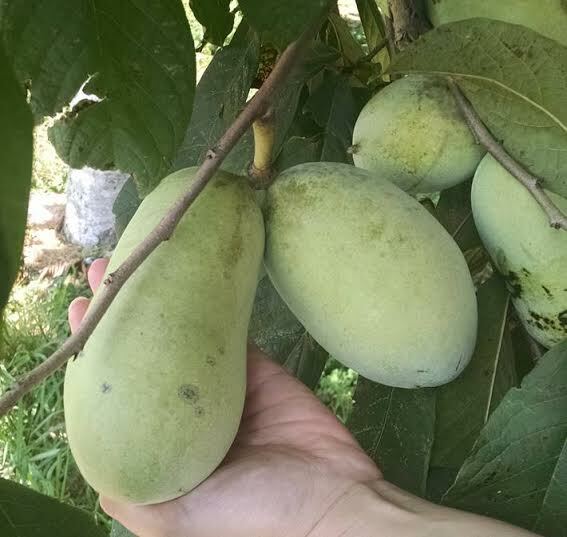 The pawpaw is making a resurgence, largely through the efforts of local farmer’s and the Kentucky State University (KSU) research farm which is actually home to the world’s largest pawpaw research program. And more and more growers are cultivating pawpaw orchards just like they would any other fruit tree. And consumers seem interested in trying the fruit that connects them to their grandparents, great-grandparents and even to our founding fathers. You can get these trees through the Kentucky Division of Forestry, which sells pawpaw seedlings through its two nurseries. Every year the division harvests seed from KSU and offers seedlings for sale to the public. You may order them online now at http://forestry.ky.gov/statenurseriesandtreeseedlings/Pages/default.aspx and pick a delivery time in Spring, as the two-year-old seedlings are best planted in early Spring. They are priced in bundles of 10 for $35. If you only want a tree or two you could consider sharing with your neighbor or donating them to a park or school. A fully mature pawpaw tree takes seven to eight years to produce fruit. But the possibilities of what you can make with pawpaws may surprise you. You can find recipes for pawpaw ice cream, bread, sorbet, tea, soda, cake, pie, sauces, muffins and even beer and wine. “Pickin’ up pawpaws…puttin’em in yer pocket”seems a little strange now…..since I had imagined for whatever reason as a kid they were peanuts !! I am interested in your farming. Please send me more information on the pawpaw. Can I have the seeds please? Greetings from Nigeria. ADEJOBI email address adejobi40@yahoo.com. Please I am waiting for your message with regards to my request for seeds . Only seeds can safely arrived in Nigeria from your Country. Ready to pay the cost. Hi there! We do not sell seeds, but the link to our ordering form for seedlings is above in the story.